SC&H Group provides audit, assurance, tax, consulting, investment banking, and personal financial planning services that consistently deliver exceptional results. If you’re a growing service organization, whether a technology provider, financial services corporation, healthcare company, or professional services firm, chances are you need a Service Organization Controls (SOC) report. After all, many of today’s Requests for Proposals (RFPs) are now requiring them, a result of increased scrutiny over third-party controls and legislative requirements such as the Sarbanes-Oxley Act of 2002 (SOX). SOC reports have also become a competitive necessity in many industries, essential to gaining client trust in your processes and controls. However, the type of SOC report needed—as well as the benefits, components, and requirements of each—are not always clear. 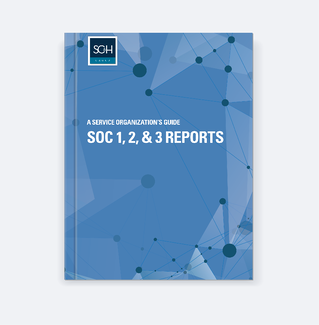 Furthermore, the nature and professional standards associated with SOC 1, SOC 2, and SOC 3 reports are continually evolving, leading to confusion on the part of not only service organizations, but also user entities (clients). And most importantly, we help you determine which report is right for your organization, preparing you for greater long-term efficiency, consistency, and success. Get this comprehensive guide now to help ensure ongoing compliance, and to build a solid foundation for long-term business success.